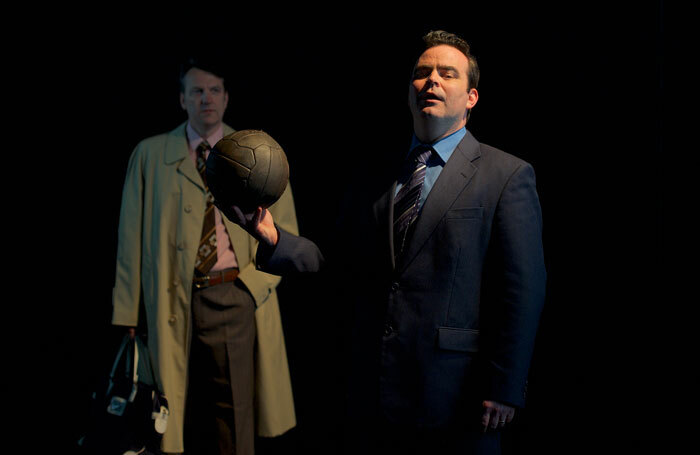 Adapted by Anders Lustgarten from David Peace’s 2006 stream-of-consciousness novel, Red Ladder Theatre’s The Damned United tells the story of Brian Clough’s ill-fated 44-day tenure as manager of Leeds United in 1974. Flitting, like Peace’s novel, between Clough’s time at Leeds and his earlier career managing Derby County with Peter Taylor, Lustgarten’s adaptation embraces a rhythmic, rumbustious, rush-of-blood intensity, focusing on Clough (an arrogant, bombastic Luke Dickson), his bitter hatred of Don Revie, and his rich relationship with Taylor (a softer, more sympathetic David Chafer). For once, here’s a play about football that sounds as if it’s written by someone that understands the game. Rod Dixon’s production, parred down from its earlier incarnation at West Yorkshire Playhouse in preparation for a UK tour, embraces the same febrile energy, utilising the sound of chanting crowds and projected silhouettes to evoke the variously euphoric and poisonous atmosphere of a football ground. Yes, this a play about football, but it’s so much more than that. It’s a tribute to an era-defining genius, a portrait of a man terminally wrapped-up in his own bravado, a study of loyalty and friendship under pressure, and – okay, fine – a bloody good story about sporting rivalry.